english name "Hammered Ringless Amanita"
=Amanita lividopallescens var. malleata Piane ex Romagn. =Amanita fraudulenta Contu nom. inval. The cap of A. malleata is (30-) 50 - 120 (-150) mm wide, hemispheric at first, then more or less conic or campanulate, and nonappendiculate, with a strongly striate margin; it is grayish beige to leaden, becoming pallid dirty white in age. The flesh is white, unchanging when cut or bruised, and rather thin above the gills. The volva is distributed on the cap in large warts or patches, pale at first, then yellowish or pale ochraceous or dirty white in age. The gills are free, creamy white to ochraceous cream and even slightly pinkish when drying, and somewhat ventricose, with fimbriate or lightly puncticulate edges . The short gills are of diverse lengths and infrequent in some material examined. The stem is (60-) 100 - 120 (-150) × 10 - 20 mm, smooth, exannulate, narrowing upward, white to off-white above, becoming progressively more snakeskin-patterned and grayer toward the base. The flesh is white, stuffed at first, and rapidly becoming hollow. The saccate volva is fragile, breaking into more or less floccose shreds and fragments, whitish or with ochraceous stains or spots on the exterior with grayer hues on the inner surface. The limbus internus was lacking in material examined. The spores measure (9.8-) 10.5 - 13.5 (-22) × (7.0-) 8.0 - 11.0 (-12.8) µm and are inamyloid and subglobose to broadly ellipsoid (occasionally ellipsoid). Clamps are not found at bases of basidia. This species has been described three different times (Tulloss, 1994) from France (Déps. Ain, Oise, and Somme). 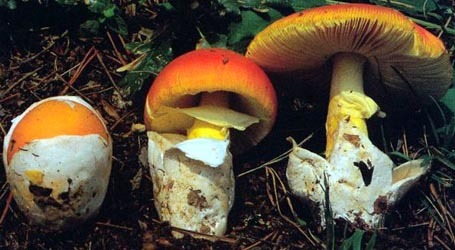 The hammered appearance of the cap in the first publication of an image of this species occurs in numerous other taxa in Amanita and is dependent upon environmental factors such localized decay from insect penetration of the cap's skin. The species is known only from Europe. author (Bon) Contu. 1986b. Boll. Assoc. Micol. Ecol. Romana 6-7: 43. =Amanita lividopallescens var. malleata Piane ex Romagn. 1982. Bull. Trimestriel Soc. Mycol. France 98: 169, fig. 1. =Amanita lividopallescens var. tigrina Romagn. ex Bon. 1986. Doc. Mycol. 17(65): 51.
non Amanita tigrina (Bull. : Fr.) Lam. 1783. Encycl. Méthod. Bot. 1: 107. ≡Agaricus tigrinus Bull. : Fr. ??. ≡Lentinus tigrinus (Bull. : Fr.) ??.
? ?Amanita subfraudulenta is cited here in MycoBank. Check this.?? holotypes A. lividopallescens var. malleata—in herb. H. Romagnesi (PC). A. lividopallescens var. tigrina—in herb. M. Bon (LIP). lectotypifications A. malleata—Tulloss. 1994. Mycotaxon 52.: 349, figs. 29-30.
type studies A. lividopallescens var. malleata—Tulloss. 1994. Mycotaxon 52: 340, figs. 23-24. A. lividopallescens var. tigrina—Ibid. : 344, figs. 25-26. A. malleata—Ibid. : 349, figs. 29-30. The following material concerning macroscopic characters of this species are derived from the several protologs cited in the text. The information concerning microscopic anatomy is based on original research of R. E. Tulloss including (Tulloss 1994). from type study of A. malleata (Tulloss 1994): [40/1/1] (9.8-) 10.0 - 12.8 (-14.0) × (6.5-) 8.0 - 10.5 (-11.8) μm, (L = 11.6 μm; W = 9.5 μm; Q = (1.10-) 1.14 - 1.39 (-1.54); Q = 1.23), hyaline or with slightly obscured contents, colorless, smooth, thin-walled, inamyloid, subglobose to broadly ellipsoid, occasionally ellipsoid, infrequently pip-shaped, often at least somewhat adaxially flattened; apiculus sublateral, cylindric, occasionally proportionately thick and prominent; contents monoguttulate to multiguttulate to granular; color in deposit not recorded. from type study of A. lividopallescens var. malleata (Tulloss 1994): [40/1/1] (10.5-) 11.0 - 13.8 (-16.0) × (8.5-) 8.8 - 11.0 (-11.5) μm, (L = 12.3 μm; W = 9.7 μm; Q = (1.12-) 1.16 - 1.37 (-1.42); Q = 1.27), hyaline, colorless, smooth, thin-walled, inamyloid, broadly ellipsoid to ellipsoid, infrequently subglobose, occasionally expanded at one end, usually adaxially flattened; apiculus sublateral, cylindric to truncate-conic; contents monoguttulate with additional small granules; white in deposit. from type study of A. lividopallescens var. tigrina (Tulloss 1994): [60/3/1] (10.0-) 10.5 - 14.0 (-22) × (7.0-) 7.8 - 11.5 μm, (L = 11.5 - 12.2 μm; L' = 11.8 μm; W = 8.8 - 9.5 μm; W' = 9.2 μm; Q = (1.09-) 1.13 - 1.51 (-2.0); Q = 1.22 - 1.41; Q' = 1.28), hyaline, colorless, smooth, thin-walled, inamyloid, subglobose to broadly ellipsoid to ellipsoid, rarely elongate, occasionally expanded at one end, with those from immature material often distorted (e.g., langeniform, pyriform, or with triangular cross-section), often adaxially flattened; apiculus sublateral or (rarely) latteral, truncate-conic, relatively broad; contents guttulate; white in deposit. 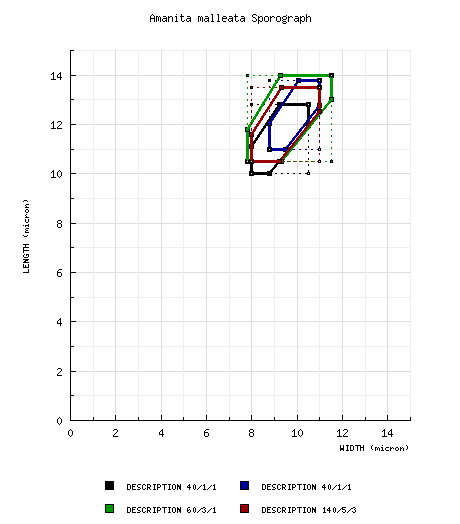 composite data from all material revised by RET: [140/5/3] (9.8-) 10.5 - 13.5 (-22) × (7.0-) 8.0 - 11.0 (-12.8) μm, (L = 11.5 - 12.3 μm; L' = 11.9 μm; W = (8.8-) 9.4 - 9.7 μm; W' = 9.4 μm; Q = (1.09-) 1.14 - 1.45 (-2.0); Q = 1.22 - 1.27 (-1.41); Q' = 1.27), predominantly hyaline, infrequently with contents slightly obscured, colorless, smooth, thin-walled, inamyloid, subglobose to broadly ellipsoid to ellipsoid, rarely elongate, sometimes expanded at one end, often adaxially flattened, occasionally "gigantic" and taking unusual shapes in immature material; apiculus sublateral (rarely lateral), cylindric to truncate-conic; contents monoguttulate to multiguttulate to granular; white in deposit. ecology From protologs: Romagnesi (1982): In calcareous or calcareous-clay soils, under broad-leafed trees, at times with some admixture of Pinus in the départments of Doubs, Marne, and Oise. Bon (1986): Under broad-leafed trees. Uncommon, end of spring into summer, in woods on calcareous clay. Originating deep in hard, clayey soil and difficult to collect without damage. Contu (1986b): Gregarious, in grassy area with calcareous soil near areas of brush or forests of broad-leafed trees, Jura Mountains. material examined Tulloss (1994): FRANCE: AIN—Arfontaine, ca. Oyonnax, 22.ix.1980 L. Bas s.n. [Bon 80092206] (lectotype of A. malleata, in herb. M. Bon => LIP, mixed collection including lectotype per Tulloss (1994)). OISE—Maysel, 6.viii.1957 H. Romagnesi 57.46 (holotype of A. lividopallescens var. malleata, in herb. Romagnesi => PC). SOMME—Robeaucourt-Franqueville, vii.1965 Depuis & M. Bon 50715 (holotype of A. lividopallescens var. tigrina, in herb. M. Bon => LIP).